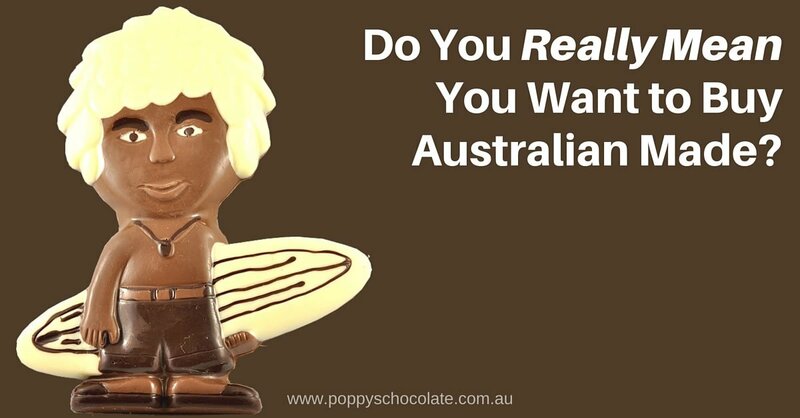 Do you really mean you want to buy Australian made? What is expensive? How does the Australian consumer define what is expensive? I hear the comment “It’s expensive” every now and then from people that come into our store and, if we are afforded the opportunity, we enlighten them about how much work it actually takes to make quality chocolates. We also remind them that they are actually getting factory direct prices in our store which are much cheaper than the actual recommended retail price of these chocolates. I feel that in Australia, we have a double standard. We want Australian quality but we want it at Chinese prices. Australia has the highest wages in the World. That means that if you want something that is Australian made, that is handmade, it will take a lot of that “expensive” labour to make it. We don’t pay people a minimum of $2 a day in Australia, we pay them closer to $200 per day. Let’s put that in perspective – the Australian minimum casual wage is actually 91 times the wage in some developing countries. Our product is handmade. That means the labour cost is more than 50% of the cost of the product. Then, of course, we have Australian labour to pack it, sell it, create websites so you can see & order what we sell and freight companies employing Australians whom charge way more than people expect to pay freight for. If you shop on Ebay, you will be used to seeing cheap freight or free freight – but this is not the case for the person selling it to you – unless it is coming from Asia. We have a flat rate of $15.90 for small orders on our website but, in fact, it can cost us up to $25.00 to send a parcel, especially as we need to insulate our product – we can’t just throw it in the post. Many Australians won’t pay that and think it is too expensive, but that is what we have to pay. On top of that, if the freight company destroys our parcel, they don’t take any responsibility for the damage. At most, they will reimburse us the freight. Now, you may be reading this and think that you don’t buy cheaper chocolates. You buy Cadbury or you buy K-Mart Belgian chocolates which, in your mind, are quality chocolates. With all due respect to Cadbury, their ingredients are much cheaper and lesser quality than ours, and they are all machine made, reducing their labour cost significantly. Additionally, just because chocolates are labelled as Belgian chocolates, doesn’t necessarily mean they are quality chocolates. We were given the opportunity to quote for one of Australia’s discount supermarkets to supply their chocolates. They were already importing from Belgium but wanted to buy Australian if possible. The price they were paying for their Belgian chocolates was so cheap, we would have lost money to compete. Another department store wanted us to make their chocolates because they were unhappy with their current supplier. I worked out not only who their supplier was but also what they were paying them. They had to be losing money and so I understood why the supplier may not have been very good with supplying them. I quoted 25% more than they were paying, which was the absolute best price I could do. I knew they wouldn’t go for it. Less than 2 years later, their supplying chocolate company was bankrupt. My business is not big enough to lose money just to compete in the big chains. Like many small business owners, I actually make less than my staff and any money I do make is reinvested. This is not a situation I like being in but this is a fact largely because people don’t want to pay for what the chocolates are actually worth. As it is, many think they are expensive. Australian wages are very high and uncompetitive at a global level. If Australians won’t pay for their own Australian made products, who do they think will? I do not bring in overseas labour. I don’t hire backpackers cheaply or tell people they can do work experience for 6 months and not pay them. I have heard of both these practices in some other Australian chocolate companies even though they are illegal under Australian law. I fully understand why they would do it though. It’s called survival. Fortunately for my team and I, most people do actually understand that quality Australian made product does actually cost money and they are prepared to pay for it. And I thank those customers for enabling us to do what we love.